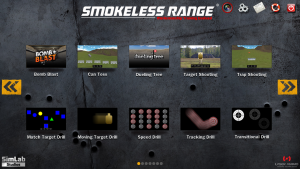 The Smokeless Range® 2.0 Simulator can be used in conjunction with your own firearm or recoil enabled training solution to practice, and dry-fire train at your convenience. Just add a laptop computer, a projector and screen or TV and you're ready to go. Practice Fast Draw, IPSIC, IPDA, home defense or hunting skills with your favorite pistol, shotgun or rifle. Use the red or infrared SureStrike™ or any of our recoil enabled training solutions, to train like a pro with this simulator, which offers ten different shooting drills. Each training drills have significant visuals and functional updates; Helping to drive the shooter’s training even further then before. In addition, the Smokeless Range Simulator gives you the option to include the new short throw camera (~3 week lead time). This custom option matches short throw projectors on the market and allows you to gain valuable training room and overcome difficult lighting conditions. **While the prefered method of use is with a projector, the Smokeless Range can be used with a television. Please see attached instructions for set up and use with a TV. ***Please click the link below to download a free 2-week demo of the software. Please be advised that this demo is for use with your computer mouse only and not with your firearm. Our Smokeless Range ® 2.0 will be released in January 2019 (after SHOT SHOW)! It will be a free upgrade ($100 value) to everyone who already owns the original version. Laser Ammo is happy to announce the first affordable judgmental and marksmanship shooting simulator - the Smokeless Range ® Simulator Combo for practicing with your own firearm or Airsoft at your convenience at home. Game Range Alpha - 5 marksmanship and training drills enjoyable for the entire family! The Simulator Combo includes a high speed camera for IR and Red Lasers. *If you are using the Smokeless Range® Simulator Combo with Airsoft (recoil enabled) Pistols we require the use of infrared (IR) SureStrike™ Vibration Cartridges. The Diamond Smokeless Range ® Simulator Combo Package is an all-in-one combination package of the Smokeless Range® Simulator that includes 8 of our simulator offerings at a discounted price! Add the SureStrike Laser Kit to use with your own firearm or add one of the recoil enabled training gun for add realism. This is by far the best and most comprehensive simulator available today for home use, competitive shooters, firearm trainers and Law Enforcement alike. - Smokeless Range® includes 10 different drills, a high-speed camera and tripod. 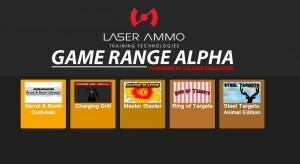 - Game Range Alpha - 5 marksmanship and training drills, enjoyable for the entire family! 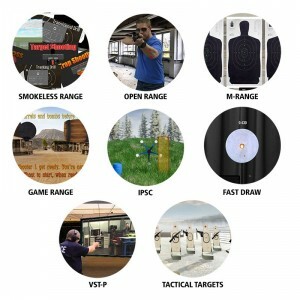 - Competitive Shooter IPSC Challenge – 5 full IPSC courses for the competitive shooter. - Fast Draw – based on a real fast draw match, and training mode. The Diamond Simulator Combo includes a high-speed camera for both red (visible) and infrared (invisible) lasers. If you are using the Diamond Simulator Combo with Airsoft (recoil enabled) Pistols we require using infrared (invisible) SureStrike Laser Cartridges. This package includes the Smokeless Range® Simulator and a high-speed short-throw camera for infrared SureStrikeTM lasers. The short-throw camera option is sold with an IR filter to be used with infrared SureStrikeTM lasers. This custom option is compatible with 0.5 short-throw projectors (not included) and allows you to gain valuable training space and overcome difficult lighting conditions. The ideal users are dealers, law enforcement, trade-show demonstrators or commercial use where space is limited, and where the user cannot control his or her lighting conditions. A short-throw camera and short-throw projector can get closer to the screen. The original Smokeless Range ® camera ratio is 1:1.6. The ratio for the short-throw is 1:0.5. For example, if your screen size is 10 feet by 10 feet, with a regular camera, the camera and projector need to be ~16 feet away from the screen. With a short throw camera, you can be ~5 feet away from the screen. The short-throw camera includes an infrared filter to assist with harsh lighting conditions. For technical questions, questions about projectors and other options, please read the user guide. Please note this is a custom order, approximate lead time for this short-throw option is ~3 weeks. This all-in-one Smokeless Range 2.0 ® Simulator Combination Package includes several of our simulator offerings at a discounted price! This custom option is compatible with 0.5 short-throw projectors (not included) on the market and allows you to gain valuable training space and overcome difficult lighting conditions. The Diamond Smokeless Range ® Simulator Combo Package is an all-in-one combination package of the Smokeless Range® Simulator that includes 8 of our simulator offerings at a discounted price! This is by far the best and most comprehensive simulator available today for home use, competitive shooters, firearm trainers and Law Enforcement alike. The most exhilarating shooting games you will ever find! The Game Range Alpha is a must have add on to your Smokeless Range® simulator that includes five marksmanship games that add more fun filled shooting practice to your Smokeless Range®. Use your own gun or airsoft, for a full simulated recoil training! Beautiful colorful design, challenging shooting drills and extreme fun for the entire family. The ultimate arcade in your own home with your own gun. Order today and get it via email so you can start practicing immediately. Barrel & Bomb outbreak – shoot barrels and bombs that are coming your way in this wild west scenario! Master Blaster: The concept of the popular “Fruit Ninja” app but use a firearm instead! Ring of Targets: hit moving targets that turn faster at every new stage, be careful not to shoot the “no shoot” targets! Steel Plate - Animal Edition: practice your hunting skills within the comfort of your own home. The Game Range Alpha does not include a high speed camera and is available only as an add-on to the Smokeless Range®. Customers must have the Smokeless Range® and camera in order to use this software. 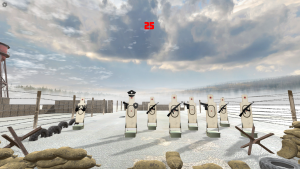 Click to download the Game Range Alpha.